Description: It's a full Residential Home filled with rooms for the whole Family. Easily walk from one room to another. Doorways and walls match up seamlessly. Use the whole house, or when shooting indoor scenes, load only the rooms required. Each room will function as a stand-alone set, with walls that can be hidden, doors that have a PERFORM, closet and desk drawers that open, window leafs can be raised and lowered. With the 11 included rooms plus garage and Hallways, it's like getting several sets for the price of one. The entire house can be loaded to the stage with all rooms in position as shown in the VIDEO. Each room is saved separately but when loaded to the stage one by one, it will form the finished house. Rooms include Living, Dining, Kitchen, Family, Kids, Baby, Office, Laundry, 2 Bathrooms, Main Bedroom plus Garage & Entrance and Upstaris Hall. Animations - Front Door has a PERFORM for Open or Open, Pause, Close. This can be cut on the time-line to adjust the close door for your specific scene. The Garage Doors also have a PERFORM for Open and Open, Pause, Close. All the Room Entrance Doors have a PERFORM for "Open Door". Closet doors, cupboard doors, drawers - are all set with pivots so that you can animate them to open and close. Rear patio door can be opened/closed on the time-line. All window leafs are sub-props that can be lifted and lowered on the time-line. In addition, rooms have had walls broken down so that you can hide walls for easier filming. 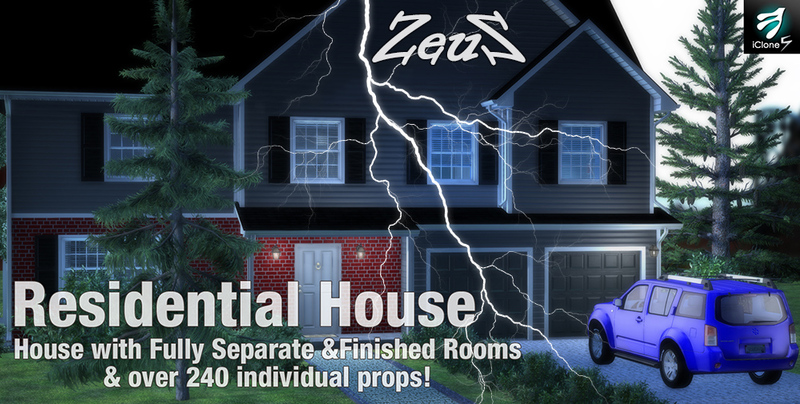 Plus, you get all the single props to further populate your rooms to look more lived in or for using in other projects. You can adjust your color schemes using the HUE dials, the diffuse Box or by launching in your photo program. Description: Christmas Toonies includes Santa, Mrs. Santa, 3 different Worker Elves and an Evil Elf to add some fun to your story. Play with the heads using the "Randomize" function or add your own heads for variation. Mr. & Mrs. Santa feature the toon head called the "Flathead". Elves have their own specially designed head. Santa hats have built in spring. Description: It's a typical American bar from the 1800's and is supplied as a complete assembled scene, allowing you to open doors, walk inside, open & shut windows and move props around to your liking. 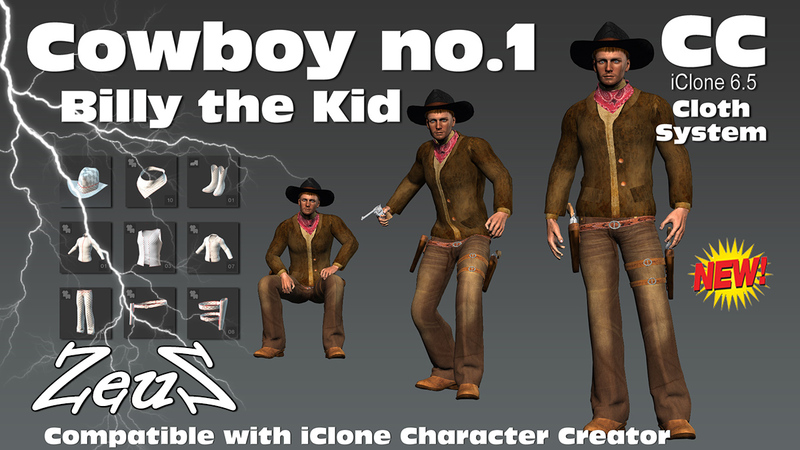 Absolutely every detail you could imagine has been included to immerse you the the historical Wild Wild West. Scene - Supplied as 6 separate parts that will perfectly align when added to the stage to provide you with a complete indoor/outdoor scene set up with a fully furnished interior as shown in promos. Parts include Saloon Base, Saloon Interior Walls, Saloon Furnishings, Room 1, Room 2, and Room 3. Additionally, the Front Wall is a separate sub-prop, with attached sub-props - easily allowing you to hide the wall with one click for ideal camera angles. Ceiling is also a sub-prop for overhead shots. 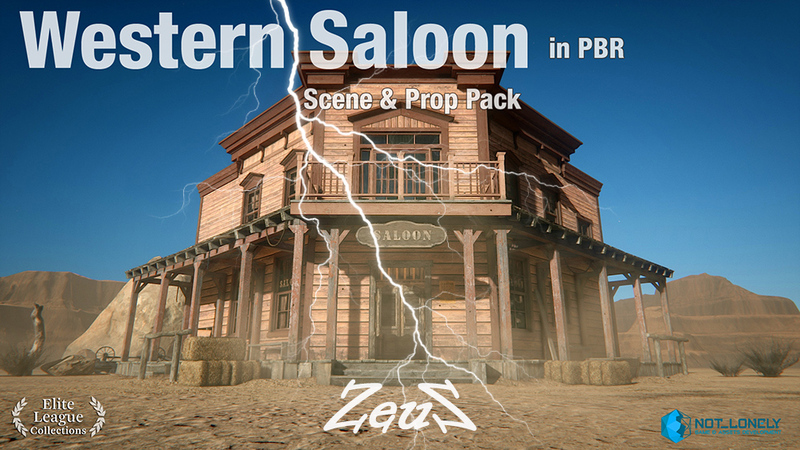 There is a prop called "Gunshot Decals" - when Saloon Base and Interior Walls are added to the stage, selecting this prop will place multiple gunshots on the walls throughout. There is also a single "gunshot" decal that you can add anywhere you prefer. Individual Props - Also supplied allowing you to add additional items to the scene or for using in your own assembled scenes. Each one with Normal/Roughness/Metallic/AO. 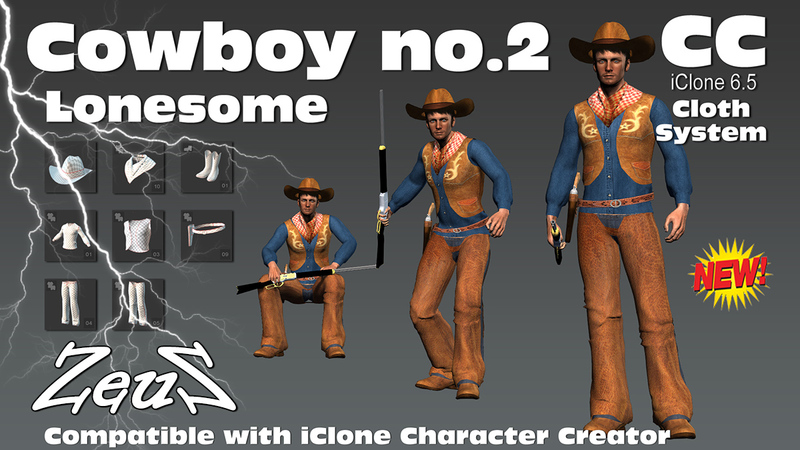 These are high quality PBR textured props with a visual quality that will truly showcase the new functions of iClone 7. Description: Everybody loves a good bad guy. Without super villains, would there even be any superheroes? 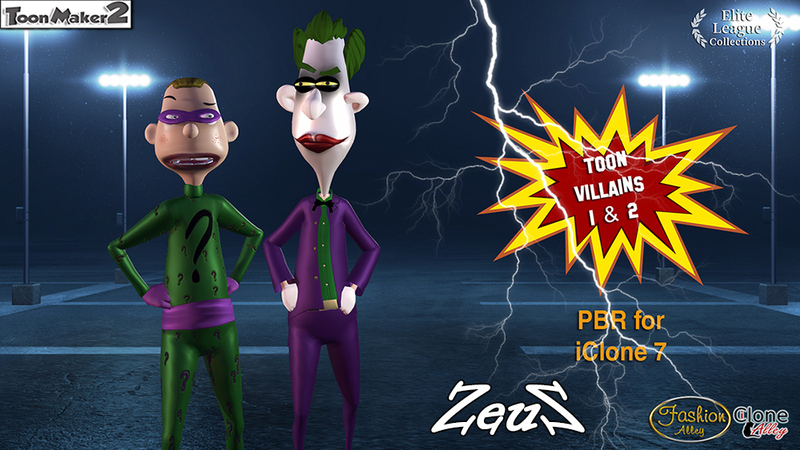 Anybody can be bad, but to be considered a villain, you have to be ruthless, powerful, and sometimes, downright crazy. 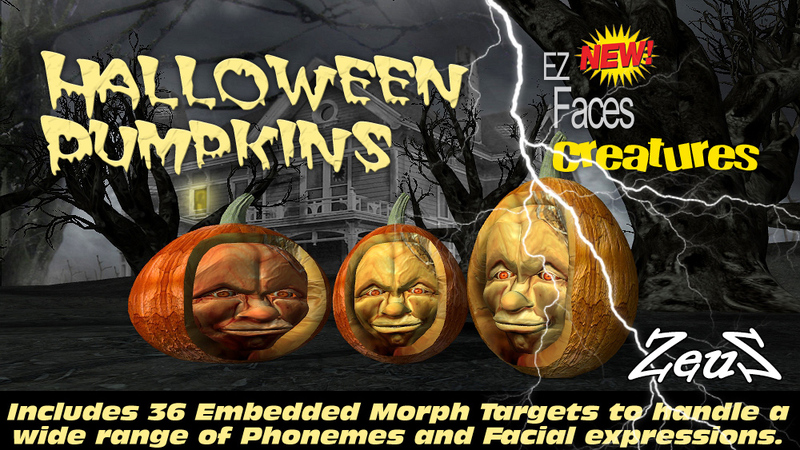 Description: These characters, "Spookie Toonies", are part of a NEW series of avatars, a SPECIALIZED High Resolution head version, capable of doing VERY natural facial motions, ideal for the expressiveness required for Cartoon Characters and totally compatible with iClone animation resources. 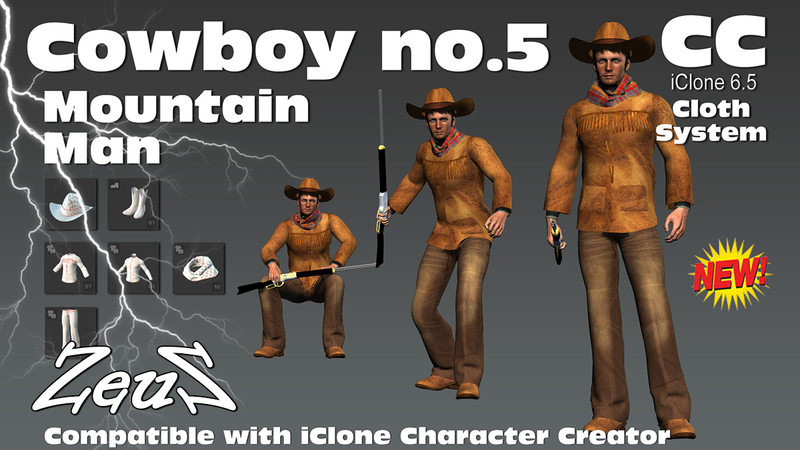 The whole characters were created from scratch, using advanced modeling techniques to guarantee PERFECT response to all standard motions and for the special animation tools available in iClone! The "Spookie Toonies" will give your season animations and promotion videos a VERY SPECIAL AND UNIQUE feel! 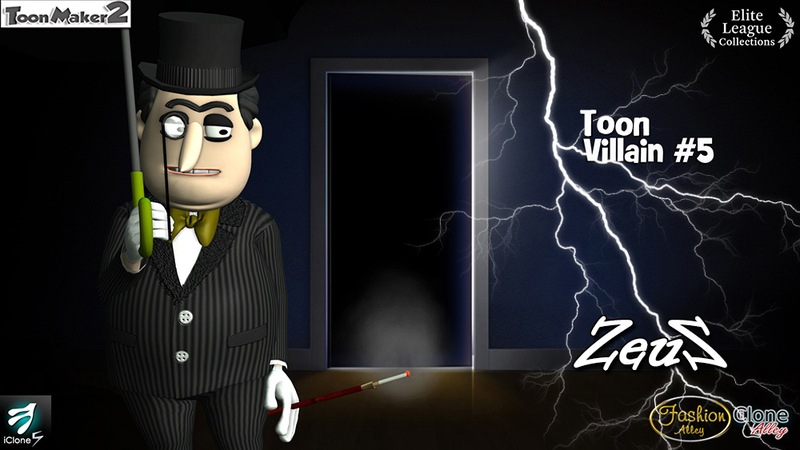 Be the first to enjoy creating very effective Halloween videos using the "Spookie Toon"! 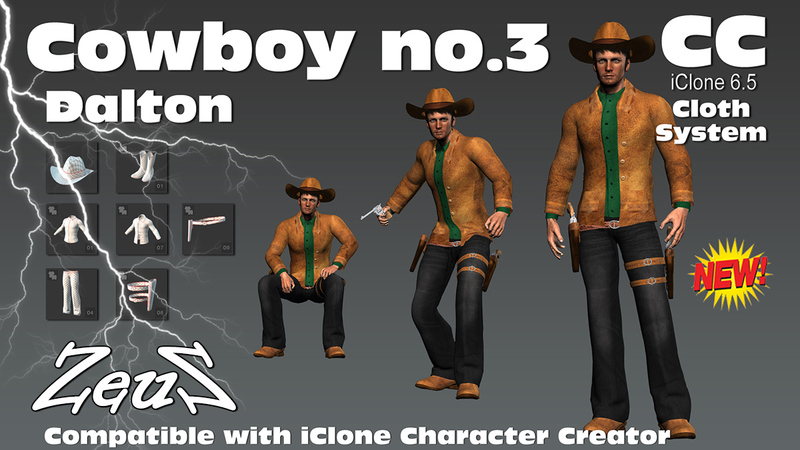 Description: This is series of photo-realistic cloths for the new Character Creator Cloth System. 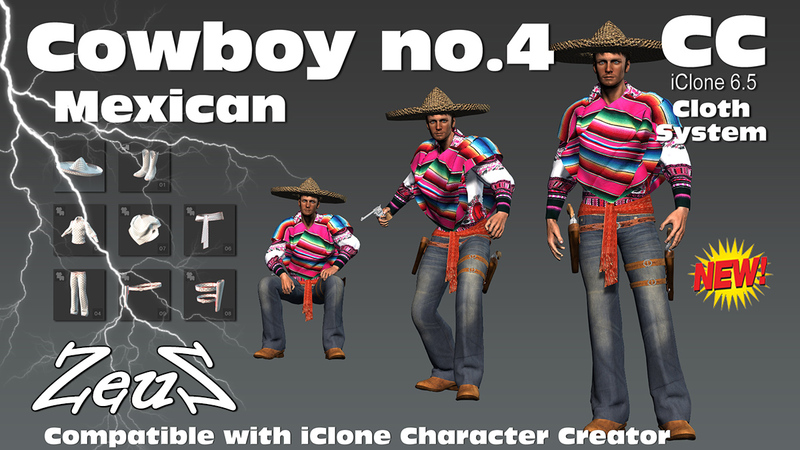 These Cloths are true native cc Cloths fully compatible with Reallusion's Character Creator cloth system which means you can apply morphs to shape and customize each character to your liking. 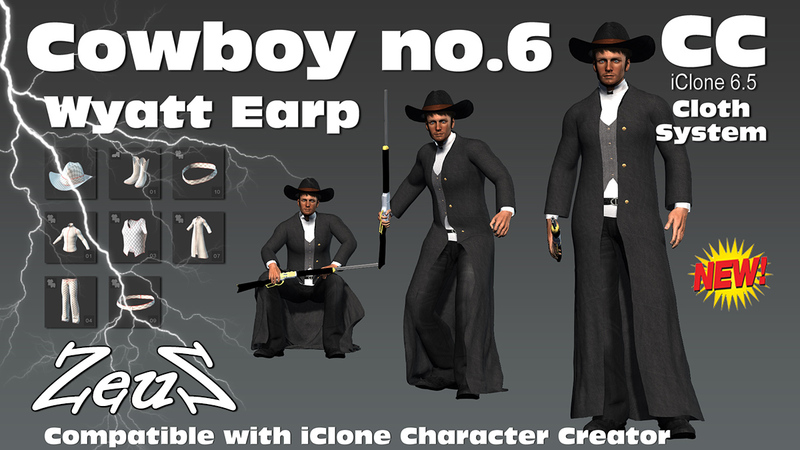 You can also save each Cloth piece as separate clothing for applications to other cc characters and complement with any other cc Cloth and accessories.